Never fishing before in the ocean on a kayak and after rigging my Costco tandem kayak ($399.99) for what I thought would be adequate for fishing LJ. My friend and true scholar (thelifeguardguy) Brain and I, for the first time ever, headed out in the dark abyss to make bait and catch fish around 5:30 AM. With several attempts to jig my new Sabiki rig, I finally caught 3 baits (correct terminology-Green Backs). Now the problem I had was how the heck do I get the hooks out of these wiggling devils. Well, with one hook stuck on the top my hand and another stuck on my palm as well, mind you, bleeding like crazy, I figured out to use my needle nose pliers to successfully get them out. I meant out of my hand. With live baits in my makeshift bait tank, still heading into the abyss, we saw a lot of baits jumping around and birds dive bombing into the ocean. Not to mention, seals, (I forgot their politically correct name) and several porpoises, when I reached around to grab a green back out of my bait tank and lo and behold, "I FILPPED MY KAYAK OVER." A little inventory check of what I gave up to the ocean god: a full tackle box of lead weights, brand new fillet knife with sheath, a rod and reel with my Sabiki rig, a head lamp, and worst of all, all my green backs. Thank goodness for thelifeguardguy and this nice gentleman from Orange County, camping at San Elijo, who both immediately came to my rescue. They helped me flip my kayak back over, retrieved my yard sale of floating items back to me, and helped me back into my kayak. THANKS TO THE BOTH OF YOU!!!! Needless to say, what was a little disturbing was everyone knew of my "flipping the kayak" on the water, asking me if I was cold? Without bait or lead weights, thelifequardguy gave me a couple of fresh baits. As he was about to hand me a bait, this bait ball completely surrounded us and started jumping out of the water. As I looked forward, about 5 yellowtail fins sticking out of the water blasted the bait ball, with about 10 other boils. Thelifeguardguy dropped his line with a fresh green back and handed me one as well. I kid you not, I barely dropped my green back into the water, preparing to cast, when my line took off. About 30 to 45 minutes later, both thelifeguardguy and I had amazing yellowtail fish. Also, the OC guy hooked up to one as well. What a day and what an experience, special thanks to thelifeguardguy for taking me out today. Last edited by molina0; 10-28-2018 at 09:37 AM. Way to stick it out! Hard learning curve AND stuck a stud Yellow, congrats! and score! great way to rally an bring home the goods. Last edited by MITCHELL; 04-25-2018 at 06:07 PM. Just goes to show you. If it floats and you have determination anything can happen..
Now return that plastic tub to Costco... tell them you almost died and buy a proper kayak. So much more fun when you aren't wet and lose your stuff. Congrats on the final outcome. Congrats on the first kayak Yellowtail. Consider yourself lucky there were others close by to help you. Like others said, take that back to Costco, get a proper quality Ocean worthy kayak and have "everything leashed" Rods, tackle boxes, etc. Also the most important thing is practice flipping your kayak and self rescue in water deeper than 8', there aren't always others to help you when it happens. I saw you on your way in, great catch. Freaking seals kept on stealing all my bait. I think I would have been better off fishing on the bottom. Did the OC kayak guy also have really dreamy eyes? Stoked you got one. IMO the yak you have is fine. Fix the weight distribution, maybe consider putting bait tank up front, and it’s good enough get out there. Hey lots of guys would have traded kayaks with you yesterday for a bit of the mojo that came with the one you were in. I could get used to the San Elijo thing, if you squint really hard you I can see the hotel at LJ in the distance. Last edited by steveooo; 04-25-2018 at 07:45 PM. 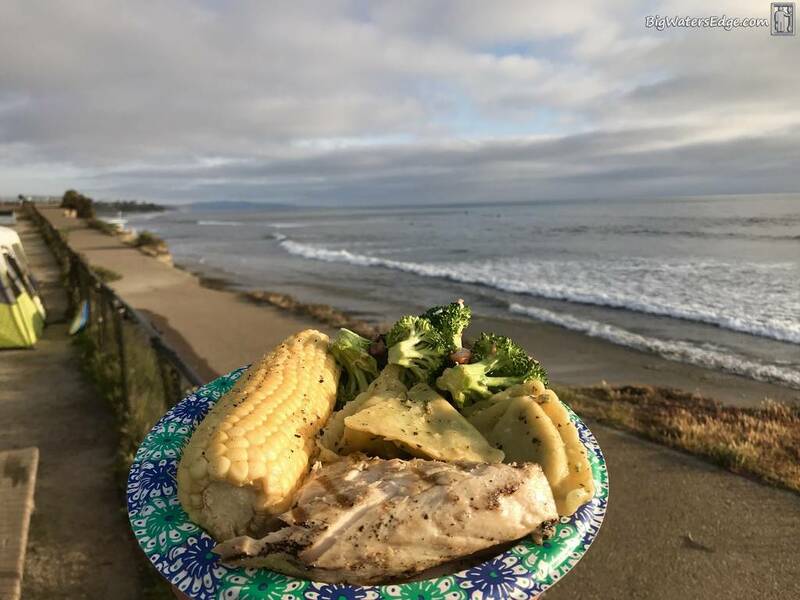 Tasty looking meal, is there a seafood restaurant at San Elijo? Last edited by katchfish; 04-26-2018 at 07:29 AM. Awesome! I’ll bet you’re so hooked now - besides the sabiki incident. Leash everything! Thanks goodness for thelifeguardguy and this nice gentleman from Orange County, camping at San Elijo, who both immediately came to my rescue. They helped me flip my kayak back over, retrieved my yard sale of floating items back to me, and helped me back into my kayak. THANKS TO THE BOTH OF YOU!!!! What an awesome first go round, beside loosing your stuff of course. Be careful you’ll probably be addicted now haha! Great catch congrats! This is what I did to eliminate turnovers.